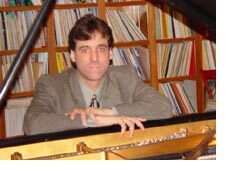 Steven Bianchi is the Director of the Amherst School of Music, Inc., where he also teaches the piano and administers its programs. Regarded as one of Western New York’s premiere music educators, Bianchi has produced numerous students who frequently have been prizewinners at regional, national and international competitions as pianists and composers. Also, many have been awarded scholarships for their university studies in music. One of his students, Charles Czarnecki, was awarded first prize at the Bartok/Kabalevsky competition, in Radford, Virginia. Another student, Dan Castellani won the Greater Buffalo Youth Orchestra Piano Competition and earned the opportunity to perform The Grieg concerto with this orchestra in the fall of 1999. In 1997, 1998, 2002 and 2004 Bianchi's students were awarded the top prize given by the Music Forum for Piano Teachers of Western New York, a scholarship for university study. In 2004, 2005 and 2006, Bianchi’s student, Mark Asirwatham won first prize in the Classical 11 class at the Dynamics Music Festival. More recently, another student of Bianchi’s, Eitan Fischer, won a 2nd prize at the 1,000 Island Chopin Competition in 2006 and then in April of 2007 won 1st prize in the highest level of the Junior Festival Piano Competition held in Baird Hall. In 2008, You Jung Kim (a.k.a. Christina Kim) won first prize in the Classical 11a class at the Dynamics Music Festival. In 2009, Tushar Kesavadas won the same prize. 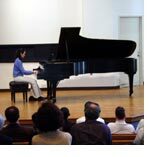 At the 2009 New York Federation of Music Clubs, District 8’s Honors Recital Competition, Bianchi’s students, Paco Quebral (Difficult Classes 1 &2) and Chanho Park (Very Difficult Classes 1&2) each won 1st prizes in their respective classes. Also, in 2009, two of his students, Eitan Fischer and Anthony Lefebrve were both invited to give lecture/recitals at the 20th Century Club of Buffalo. In 2010, Lizz Abt received Nazareth College’s top music scholarship where she will pursue piano performance and music education. Also, in 2010, Yankang Yang won 1st prize in the Dynamics Music Festival and 1st prize in the NYFMC, District 8, Difficult Class 1 and 2 and in the same competition Chanho Park won 1st prize in the Musically Advanced Class 1 and 2. In 2011, Chanho Park performed the First movement of the Grieg concerto with the Williamsville East High School Orchestra and received a scholarship to minor in piano performance at Calvin College. Tushar Kesavadas won 1st prize in the NYFMC, District 8 Very Difficult Class 1 and 2, and Yankang Yang won 2nd prize in the same class. In 2012, Alex Kofke performed the first movement of Rahmaninov’s 2nd piano concerto with the Williamsville North Orchestra. Lexi Anczok was accepted to Nazareth College to study piano. Lucas Colon won 1st prize in the the NYFMC, District 8 Difficult Class 1 and 2, and Lauren Scanio won 1st prize in the NYFMC, District 8 Very Difficult Class 1 and 2. Bianchi began taking piano lessons at the age of seven with Estelle Seifert of Williamsville. He then began teaching in 1975 and in 1978 was awarded an apprenticeship in piano performance and pedagogy at the Bradley Institute for Music Education Research at the age of eighteen where he studied with Harold Bradley (1906-1984). Bradley had studied with two of the great legendary pianists from the Golden Age of Pianism, Isidor Philipp (1863-1958) and Mark Hambourg (1879-1960). Thus, Bianchi absorbed the French, Russian and German piano traditions through his association with Bradley. Then studies with Norman Anderson at the Guildhall School of Music in London, England and further studies at the University of Buffalo, with Professor Frina Boldt, resulted in a Bachelor of Arts degree in music and a Master of Arts degree in music history, both from UB. During these years, Bianchi also studied jazz harmony and arranging with the renowned jazz accordionist and pianist, Russ Messina. Bianchi's Masters thesis on the noted Niagara Falls, NY composer, John Pierce Langs (1882-1967), is the definitive study of the composer and his works and an important contribution to American Music History. Bianchi has subsequently established the John Pierce Langs International Piano Competition, which debuted in 1994 and has drawn competitors from all over the world. A frequent judge for music festivals, Bianchi also was President of the New York Federation of Music Clubs, District 8 and chairman of its annual Junior Festival from 1988 until 2012. Last year, he once again presented a lecture on Community Level Music Teaching at Houghton College. As composer, his piece, Three Pieces for Jack, received its world premiere in June of 2001 at Buffalo State College’s Rockwell Hall. Bianchi performed it while dancers from Maris Battaglia’s American Academy of Ballet danced her choreography of this work. This ballet was presented once more at Chautauqua Institution in their amphitheater. It is a solo piano work devoted to his brother Jack who died in 1972 of cancer at the age of seven. The three movements are titled: 1. Childhood 2. Funeral March 3. Afterlife. He has performed for the Amherst Youth Ballet and in the June recitals for the American Academy of Ballet for the past seven years. Bianchi is also involved in writing a series of pieces and excersises for young pianists. In 2012, he performed at UB in the May recitals for the American Academy of Ballet a piece called Tango which he composed earlier in the year. It was also presented at the Chautauqua Institution in their amphitheater in August of 2012. Recently a music video was made of Bianchi and the renowned guitarist Mir Ali playing an arrangement of Bianchi's Tango in A minor, posted on www.celestiallynxcinema.com. One of Bianchi's students, Alexandra Viola, was awarded the Claudette Sorel Piano Scholarship for study at SUNY Fredonia in the fall of 2015. In 2016, Bianchi gave a lecture at Buffalo State College entitled "Community Level Piano Teaching" where he discussed his 42 year career in piano teaching. In 2017, he gave a similar presentation at SUNY Oswego to their Piano Pedagogue Class. In 201, two of Bianchi's students, Maddi Ohrbach and Jordan Gaskin, were chosen as finalists in the Claudette Sorel Piano Competition which took place at Fredonia Universy. Also, Simone Viola was chosen to play in a masterclass given by Angela Hewitt while she was in Buffalo for her concerto performance with the BPO. In June of 2017, Jordan Gaskin played the Grieg Piano Concerto with the Williamsville East Symphonic Band. In 2017, Simone Viola was a finalist in the Claudette Sorel Piano Competition and received an Honorable Mention at the Ithaca College High School Competition. She will major in Piano at the University of Toronto starting in the Fall of 2018. Maddi Ohrbach gave a solo piano and voice recital in June of 2018 in Lippes Hall of Slee Hall at the University of Buffalo. Liszt and Prokofiev transcriptions, solo works by Debussy, Bolcom and Glass, two songs and duo-piano works comprised her recital. She will major in voice at the Peabody Institute. William Deinzer tied for first prize for the summer camp scholarship given by the Music Forum for Piano Teachers of WNY. After 43 years of teaching the piano, Bianchi has the rare distinction of having given more that 100,000 half hour piano lessons! As a result, he has begun to write a book devoted to piano pedagogy, which will be aimed at helping the new piano teacher acquire efficient and effective piano teaching skills quickly. Student is required to practice at least 180 minutes each week. Please document the amount of time spent practicing each day. This will help me give you an appropriate assignment each week. Remember, 180 minutes is a minimum amount of practice time. Older students and those students taking 45 or 60-minute lessons should consider longer practice sessions, especially on the weekends. After every 1000 minutes of practice, get a prize from the Treasure Chest. In order to participate in a recital, the student must fill out an application form. You may get an application form from your teacher or click here to download application form. Plan A – participation in this plan is contingent upon student completing weekly contract of at least three hours of practice a week, preferably six, 1/2 hour sessions a week. This suggested amount of time, three hours, is basically a minimum amount and those students taking longer lessons should consider longer practice sessions. Plan B - under this plan there is no required contract for practice time. Make-up lessons will be provided either during the trimester, during the first few days of vacation or during the summer session. Make-up lessons will not be carried over into the next school year. To receive a make-up lesson I must receive notice of cancellation 24 hours ahead of the scheduled lesson time. Payment is due at the first lesson of each trimester. Additional charges will be made for books, recitals and/or festivals. Summer lessons – Usually I teach six weeks during the summer. Students can opt for as many lessons as they like. Payment will be arranged at that time.